The information below is from NASA. Whatever they are called, tropical cyclones all form the same way. Tropical cyclones are like giant engines that use warm, moist air as fuel. That is why they form only over warm ocean waters near the equator. The warm, moist air over the ocean rises upward from near the surface. Because this air moves up and away from the surface, there is less air left near the surface. Another way to say the same thing is that the warm air rises, causing an area of lower air pressure below. A cumulonimbus cloud. A tropical cyclone has so many of these, they form huge, circular bands. Air from surrounding areas with higher air pressure pushes in to the low pressure area. Then that “new” air becomes warm and moist and rises, too. As the warm air continues to rise, the surrounding air swirls in to take its place. As the warmed, moist air rises and cools off, the water in the air forms clouds. The whole system of clouds and wind spins and grows, fed by the ocean’s heat and water evaporating from the surface. Storms that form north of the equator spin counterclockwise. Storms south of the equator spin clockwise. This difference is because of Earth’s rotation on its axis. As the storm system rotates faster and faster, an eye forms in the center. It is very calm and clear in the eye, with very low air pressure. Higher pressure air from above flows down into the eye. If you could slice into a tropical cyclone, it would look something like this [above]. The small red arrows show warm, moist air rising from the ocean’s surface, and forming clouds in bands around the eye. 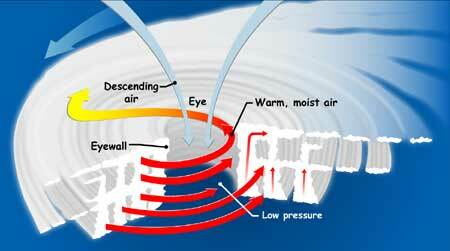 The blue arrows show how cool, dry air sinks in the eye and between the bands of clouds. The large red arrows show the rotation of the rising bands of clouds. When the winds in the rotating storm reach 39 mph, the storm is called a “tropical storm.” And when the wind speeds reach 74 mph, the storm is officially a “tropical cyclone,” or hurricane.